Huntington Beach residents Heidi and Ryan Blackstock photographed in Laguna Beach in an AcroYoga bird pose variation. Photo by Melissa Gayle. 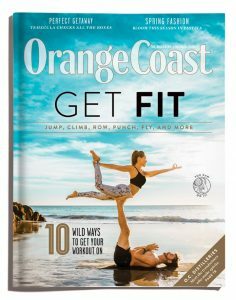 You and your husband Ryan are photographed on the cover in an AcroYoga bird pose variation. When did you start doing AcroYoga together? In 2015, I signed us up for a week-long AcroYoga immersion workshop in Santa Monica with the incredible Jason Nemer, the founder of AcroYoga. AcroYoga is all about communication, trust, and play. Since then, we have offered AcroYoga as one of the many workshops at Camp Xanadu, our 3-day annual summer camp for adults on Catalina Island in September. Tell us about The Xanadu Life, the lifestyle events company you co-founded together in 2013. We started The Xanadu Life because we wanted to inspire the community to get outside to connect with each other through wellness, education, and green living. We felt like there was a need to give people a break from the busyness of the concrete jungle and their digital devices. We love bringing people together over sunshine and adventure. Over the 7 years, we’ve hosted 100+ events in 20+ cities with 6,000+ attendees in the most beautiful of places. We’ve been featured on the Travel Channel’s “Secret Waterfalls” and have traveled all over the world to film with them, including one of our all-time favorites—island hopping in the Bahamas. Most recently, one of our Havasupai trips was featured on the Illinois Lottery for their $550 million dollar jackpot campaign. Don’t worry, you don’t need to be a millionaire to join our events. All are welcome! What’s the key to planning a successful event? It’s a calculated science experiment and the key is having the right amount of all the right ingredients. Having a vision, commitment to the craft, and positive vibes that attract the tribe are also essential. Describe the moment you knew that you created something unique with The Xanadu Life. It was during our very first Xanadu event. Ryan and I were sitting on the sand on the beach in Two Harbors, Catalina Island, taking in all that was around us: the stars above us, the ocean around us, the mainland lights in the distance, and all the humans dancing, laughing, connecting, and having such a great time. We realized, ‘All of these people are here because we had an idea that we made into reality. And out of all the other things they could do, they decided to embark on this adventure and be with us on this island right now.’ It was an overwhelming sense of gratitude and accomplishment for all the happiness around us. 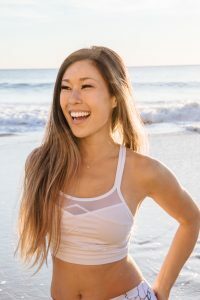 What do you love most about being a yoga instructor at Equinox in Huntington Beach? I love that it sits on the 2nd floor of Pacific City overlooking the Pacific Ocean lined with happy palm trees! How would you describe your instructing style? Strong yet fluid. Challenging yet rejuvenating. Playful yet focused. Equinox classes. Beach runs. Xanadu activities/events. And living an all-around active lifestyle plus eating a healthy diet packed with fresh foods and veggies. What do you love most about living in Huntington Beach? I love living in Huntington Beach with my husband Ryan, being so close to Huntington Dog Beach, and being able to run to Equinox. We have such a great community around us. Favorite place in O.C. to grab a healthy bite? JuiceMi in Newport Beach is amazing! They have a colorful selection of customized superfood smoothie bowls that are to die for. Everything about the cafe is so picture-perfect. Mimi, the owner, is a fellow badass women entrepreneur, and we love supporting each other in our endeavors, and partnering up on events when we can. What has been the most rewarding aspect of running The Xanadu Life? The most rewarding aspect of running Xanadu is seeing the positive impact it has on individuals as well as the community as a whole. Hearing people talk about how much Xanadu has changed their lives and witnessing how it brings friendships and businesses together is invaluable. I feel so incredibly blessed. Keep up with more upcoming outdoor lifestyle events at @thexanadulife on Instagram.